Travel with us to the desert sands of Africa, where we find David Aspinall, a young man who left his family and farm in search of adventure, and finds himself in the wastelands of greed. You’ll find yourself asking some important questions as the story unfolds. What’s the difference between discerning God’s call and pursuing your own dream? Discover your own rich treasure in this unforgettable story based on Psalm 32. From Sophia Holdorf of Ventura, California on 1/7/2019 . This story is a spin-off of the prodigal son, but done in a modern, very relatable way. The voice actors are excellent, the messages are clear and Biblical, and Christ's redemptive power is clearly seen. 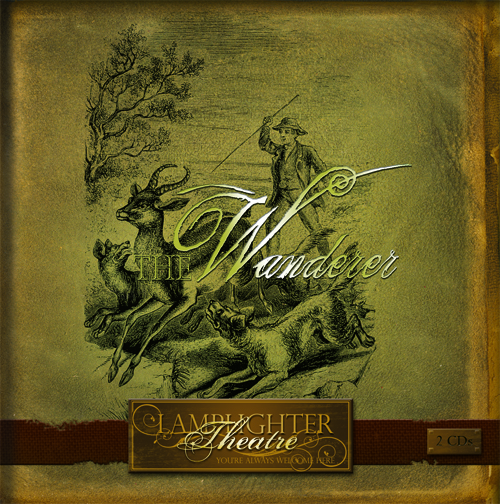 "The Wanderer is sure to be a family favorite! From Tashia Miller of NEW OXFORD, Pennsylvania on 10/20/2018 . I grew up listening to Lamplighter stories and continue to this day! The stories are so fun and full of amazing life lessons. From John N of Knoxville, Tennessee on 7/18/2018 . The Wanderer is an amazing story, complete with drama, action, and relationship intrigue. Brilliantly done with spectacular sound quality. Will buy more in the future. Awesome for Teens & Pre-Teens! From Alina Ignato of Hilton, New York on 4/26/2018 . A very awesome story. We listened to it with our children (ages 14, 12, 9, 6) and everyone loved the story! Highly recommended! From Terrance Layhew of Williams Bay, Wisconsin on 12/14/2017 . It's a mistake for people to assume these are only for younger audiences. As a jaded 22 year old my heart was touched by this classic story of repentance and redemption. If there's someone in your life who's wandering down the wrong paths, I highly recommend this story both for them and for you.